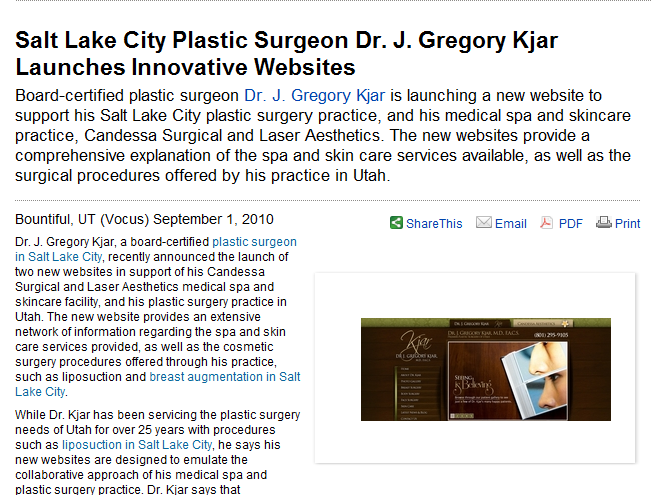 Dr. J. Gregory Kjar is proud to announce the recent launch of two new websites to support his Utah-area plastic surgery and medical spa patients. By providing a connected network of information concentrating on the combination of premier plastic surgery and the latest in spa and skin care treatments, Dr. Kjar is helping his patients achieve their ultimate aesthetic enhancement goals. The Candessa Aesthetics website concentrates on the latest in surgical and laser skin care treatments, such as laser resurfacing and injectables, while Dr. Kjar’s plastic surgery website incorporates a breakdown of all cosmetic enhancement procedures, as well as a before-and-after gallery, and patient testimonials. Coupled with a sleek website framework and easy-to-navigate menus, Dr. Kjar’s patients will find the plastic surgery website design informative and aesthetically pleasing.